Welcome to OXFORD BIOMEDICAL TECHNOLOGIES, INC.
Oxford Biomedical Technologies is the true leader in the field of food sensitivity testing, therapy, training and technology development. Utilizing the world’s most advanced, proprietary instruments (MRTIII), Oxford offers the patented Mediator Release blood test (MRT), the most innovative and clinically useful test for hidden inflammatory responses to foods and food-chemicals. Oxford makes it easy for practitioners and patients to consistently achieve the best outcomes in the shortest time. MRT, when combined with Oxford’s unique and highly effective LEAP anti-inflammatory eating plan, provides quick and lasting relief for irritable bowel syndrome, migraine, fibromyalgia, and a wide range of other food sensitivity related health problems. Both MRT and LEAP are foundational components of optimal health and wellness. If you are a healthcare practitioner, click on the practitioner link below and learn why MRT and LEAP are the best choices for your practice. If you are a patient, click on the patient link and find out if your food is making you sick and how you can achieve quick and lasting relief to all of your food sensitivity related symptoms. 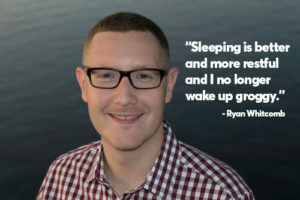 Graduated as RD, Ryan was diagnosed with obstructive sleep apnea and given a CPAP machine. Then he came across the LEAP protocol. Full Story. Purchase the Certified LEAP Therapist Training Course Today!